“The Unusual School System of a Suburban Community” » James Betelle, Where Are You? This article is from the 1928-1929 Yearbook of The American School and University. Much of the text is similar to the CHS article from American School Board Journal, which came out about the same time. It’s interesting to note that Betelle refers to “Messrs. Guilbert & Betelle, the architects for all these new buildings”, as if his partner, Ernest F. Guilbert, were still alive (he died in 1916). Also note that a number of the equipment suppliers at the end of the article may be seen in the advertisements I posted a while ago. The village of South Orange and the township of Maplewood, N.J. are two separate municipalities, which are entirely independent of each other, but the direction of whose educational affairs is vested in a single Board of Education. These towns are fast-growing communities, within commuting distance of metropolitan New York. Their school population has doubled within the last eight years and will probably double again in another eight years. These communities are typical American suburban villages, with a very high type of citizenship. Most of the heads of the households are business men who commute daily to their office in New York or Newark. 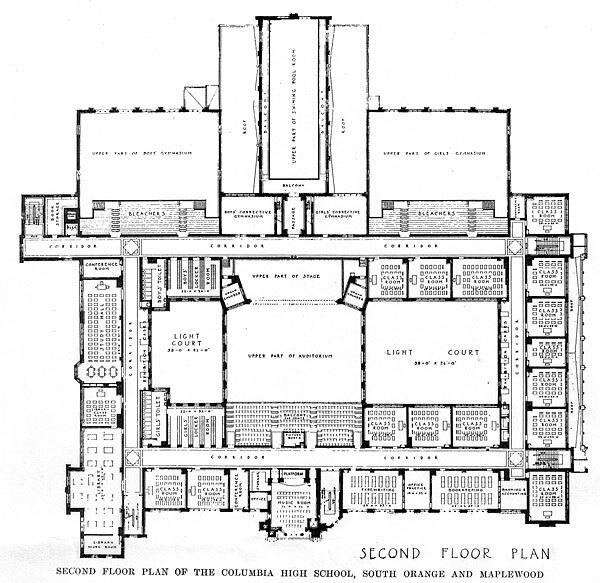 A large percentage of the citizens of South Orange and Maplewood have sufficient means to send their children to private schools if they desire, but they have felt it better and more democratic to build good free public schools, and the illustrations accompanying this article show the type of buildings erected and the facilities provided. No private school in a community such as we are discussing can pretend to compete with public schools, either in the facilities provided or in the quality of teaching, for the very good reason that a private enterprise has not the capital which is made available by the many property holders in s wealthy suburban community. So it resolved itself into the question, why should a citizen pay tuition to a private school when there is a public school which his taxes help to support and which his children can attend without cost? The school system has been recently reorganized and placed upon a junior high school basis; that is, there are a number of six-grade schools, there will be several junior high schools when the organization is entirely completed, and just recently the new Columbia Senior High School was finished and occupied. The grade schools are strictly community schools where no child lives more than about a half-mile from the school site. All of these grade schools contain about the same facilities; that is, the standard classrooms, an attractive kindergarten, an auditorium, and a gymnasium. It has been the endeavor of the Board of Education to build these schools in such a way that they will be an improvement to the neighborhood rather than a detriment. Such were the instructions given to Messrs. Guilbert & Betelle, the architects for all these new buildings. The successful results are show by the accompanying photographs and by the increased valuation of neighboring property and the fine houses built around the new schools. As far as possible each school had been made to harmonize with its neighborhood; for instance, the school built of stone is located on the side of the Orange Mountain, where there are numerous quarries of the stone from which the school has been built. The citizens have responded in a very excellent way to these fine types of schools, so that they are now not only proud of the school system but are back of it in every way. With the erection of the new Columbia High School, which is located in the geographical and population center of the two communities, the building program reached its highest expression, and there are few schools in the country of its size that contain a greater number of such fine educational facilities. As indicated by the plans, the standard classrooms are supplemented by rooms for special subjects, all of which are liberal in size for their purpose, as it has been found that as a rule these special rooms are crowded when furniture has been installed. The auditorium, in the center of the building, seats 1,300 persons, and incorporated in the large stage is a handsome pipe organ. The boys and girls have been treated equally as far as gymnasium accommodations are concerned, each having a full-size gymnasium, with permanent concrete bleachers across one side. Between the two gymnasiums has been located a tile-lined swimming pool, with a spectators’ gallery above and around it. The tank proper is 25 feet wide and 75 feet long. Between the swimming pool and the gymnasiums are the boys’ and girls’ locker-rooms, so they serve both the gymnasiums and the swimming pool at the same time. The materials used throughout the building have been selected with care, and with a view of being substantial yet simple, and suitable for the hard usage to which a school building is subjected. The exterior of the building is in the Gothic Collegiate style, of red brick with limestone trim and a variegated slate roof, and is fireproof throughout. On top of the central entrance tower has been built an astronomical observatory to accommodate a telescope which has been presented to the school. Directly beneath the observatory is a classroom of conference room to be used in connection therewith. As it is anticipated that this observatory will be used by some of the study clubs of the community, an elevator has been run from the vestibule of the main entrance tower to the roof, to avoid the tiresome climbing of stairs. The building has been located on a large plot of ground, and the girls’ athletic field is in the rear. The boys have a large athletic and football field in another part of town. Special consideration was given to parking facilities on the property, and a very large area, paved with concrete, has been provided for this purpose, as the parking of automobiles is becoming more and more of a problem, not only during the day sessions, but more particularly during entertainments given in the auditorium in the evening. This parking space has been brilliantly illuminated and will be policed when the number of parked automobiles makes it advisable. The building has a maximum pupil capacity of 1,630 pupils. It contains 2,860,000 cubic feet, and cost $1,500,000, exclusive of land and equipment. Art, Laboratory and Shop Equipment – E.W. Sheldon & Co.
Auditorium Seats – Steel Furniture, Co.
Blackboards – Knickerbocker Slate Co.
Boilers – Kewanee Boiler Co.
Classroom Furniture – Heywood-Wakefield Co.
Clocks and Signal Systems – Howard Clock Co. Drinking Fountains – The Halsey W. Taylor Co.
Fire Alarms – Stanley & Patterson, Inc.
Flooring Material – Bonded Floors Co., Inc.
Gymnasium Equipment – A.G. Spalding & Bros. Heating and Ventilating System – Peerless Unit Ventilation Co., Inc.
Heat Regulating System – Powers Regulator Co. Lighting Globes and Fixtures – Westinghouse Electric and Mfg. Co.
Lockers – Durabilt Locker Co.
Office Equipment – The Van Dorn Iron Works Co. Plumbing and Sanitary Equipment – James B. Clow & Sons. Projecting Equipment for Moving Pictures – International Projector Corp.
Refrigeration Equipment – Frigidaire Corp. Swimming Pool Equipment – Wm. B. Scaife & Sons, American Steam Pump Co., Wallace & Tiernan Co., Inc. Window Shades – Stewart Hartshorn Co.
Woodworking Machinery – Oliver Machinery Co.